One of the wild activities that you can take part in is ‘Tracks and Signs’. Some wildlife can be extremely hard to see. Many creatures only come out at night, or they may be very shy and hide from us. Lucky for us, most animals leave behind clues to tell us where they’ve been and what they’ve been doing. Anything from fallen feathers and fur to footprints and even poo can tell us a story. It just takes a little practise to know where to look! The good news is that by spotting them and working out what they mean, we can follow an exciting story of what’s going on out there. So what did happen last night? All you need to find out is something to photograph your clues (or a bag or box to put them in), our animal track guide, a magnifying glass and a notebook. You can even follow our guide to make your own simple animal tracker, which you can use to find out who comes into your garden at night. Why not go for a slow walk and look for clues? You could start in your own garden, or try a path through a wild place. Pay particular attention to muddy spots where animals might leave their footprints, and keep an eye out for broken eggshells, animal hair or droppings. If you want some expert help to get started on this activity or just want to discover some new species you don't have at home, then why not book a place on one of our reserve Big Wild Sleepout events, which start from next weekend! You'll be able to tick off several Wild Challenges all at the same time then too! Our Big Wild Sleepout tracking exercises are the perfect opportunity to find out more about some of our rarer and most secretive species and exactly what they get up to when we’re asleep! Keep an eye out for wood mice RSPB Pagham Harbour, roe deer tracks at RSPB Farnham Heath, or even stoat footprints at RSPB Pulborough Brooks. You might even be lucky enough to find traces of the flight path of a barn owl at RSPB Rainham Marshes, or badger tracks at RSPB Dungeness. Starting next weekend, our Big Wild Sleepout events are once-a-year opportunity to camp out with us under the stars and take part in a whole host of wild activities that can all count towards your Wild Challenge award! 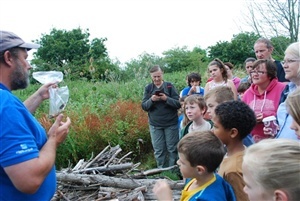 Other activities include bug safaris, pond dipping and moth trapping. Booking is essential, and early booking is advised. For full details of each South East reserve event you can read our Big Wild Sleepout blog or click on the reserve name above!